The Harvard sophomore helped develop a drop-based microfluidics platform for the early diagnosis and treatment of cancers. 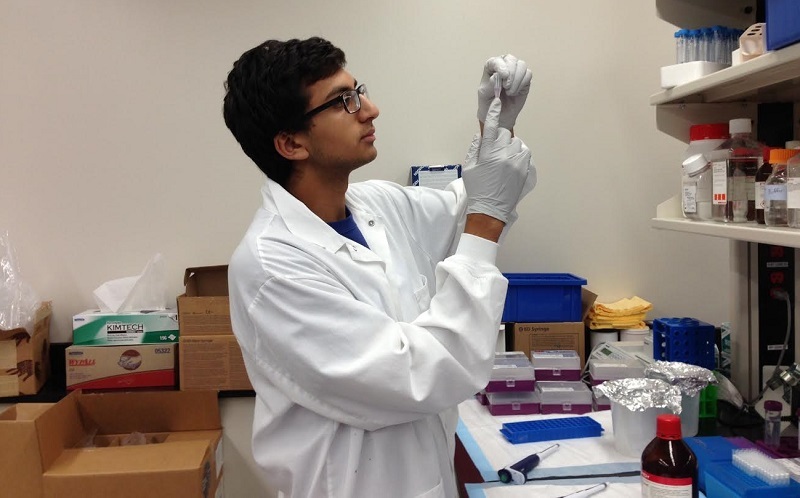 WASHINGTON, DC: Indian American Neil Davey, a sophomore at Harvard University, has been invited to the White House Science Fair to showcase an invention that could provide a major breakthrough in cancer diagnosis. The Gaithersburg, MD, native will present a device he helped develop, a drop-based microfluidics platform for the early diagnosis and treatment of cancers, at the event, which will be held on April 13. Davey helped develop the technology at the Harvard School of Engineering and Applied Sciences in the Laboratory of Prof. David Weitz, in collaboration with researchers at Massachusetts General Hospital. The device uses DNA amplification techniques to very specifically target a wide range of cancer genes and quantitatively detect circulating tumor cells from the blood stream, the Indian American student told The American Bazaar in an email. Davey, the son of Raj S. Davé, a partner at the law firm Pillsbury Winthrop Shaw Pittman LLP, and Washington, DC, area immigration attorney Aparna Dave, said given the “invasive nature of traditional tumor biopsies, the holy grail of cancer diagnosis is to detect cancer cells directly from the bloodstream through a ‘liquid biopsy.’” Because “cancer cells are incredibly rare and heterogenous in the blood,” it is a huge challenge “addressing this demand,” he said. His technology, the young scientist said, also allows for unprecedented sensitivity, detecting as low as 1 cancer cell amongst 1 billion blood cells, and subsequently isolates individual circulating tumor cells that can be characterized or sequenced for individualized cancer patient treatment. Davey — who is studying applied mathematics and economics on a pre-medical track — has been working on his cancer detection project since his junior year high school. Upon his arrival in Cambridge, Mass., he duly picked up his research at the Harvard School of Engineering and Applied Sciences while collaborating with scientists at Massachusetts General Hospital. The brilliance of Davey’s endeavor lies in its enhanced efficacy: “Unlike existing DNA amplification techniques that can only detect maybe one cancer cell out of a thousand wild-type cells, this technology can detect one cancer cell from a billion normal cells,” he said. “Most importantly, it allows for a single circulating tumor cell to be isolated, which can be further characterized to understand the unique nature of the patient’s cancer,” he continued. While Davey’s invention is overtly focused on cancer, his innovative offering to the biotech sector can also be used to diagnose infectious diseases such as HIV, HPV, and Tuberculosis, according to the young luminary himself. Over the years Davey’s passion for science-based humanitarianism has not been limited to his cancer-detection project. Not only has the Indian American worked in various laboratories while pursuing other biomedical research, he also co-founded two technology start-ups, one of which is a social venture to reduce female feticide in India. Around campus, Davey is involved with the Institute of Politics as an economic policy fellow, the Health Policy Review, the South Asian Association, and the Harvard College Consulting Group — a non-profit student organization that advises influential businesses and national non-profits on strategic decisions using quantitative and qualitative analysis. Furthermore, he recently founded the Harvard Development Initiative, which aims to spur sustainable and scalable development by empowering local youths in South Asia. Despite his numerous accomplishments to date, Davey — who is “incredibly passionate” about playing the tabla and learning languages, particularly Sanskrit — is still thrilled at the prospect of attending the White House Science Fair next week. Obama hosted the inaugural White House Science Fair six years ago. Since then, a plethora of talented students have attended the annual event and presented projects that look to address some of the United States’ greatest challenges. Congrats Neil and Compliments to your Parents-Dave family, for the achievement. If convenient, call me back- Vinodray Mehta (of Ahmedabad) care of Tushar (my son) Resi 757 – 353-4952 at VA Beach.